Take Interstate 66 West to U.S. 29 South at Gainesville. Follow U.S. 29 South into Charlottesville and look for the signs for the U.S. 250 West/U.S. 29 South Bypass. Follow this bypass to Interstate 64 East (direction Richmond). Take Interstate 64 East and get off at Exit 121A onto Va. Route 20 South (direction Scottsville). At the second stoplight, turn left onto Route 53 (Thomas Jefferson Parkway) Follow Route 53 East for about 1.75 miles. Immediately after passing under the stone-arch Saunders Bridge, exit right onto the roadway that leads over the bridge and onto the grounds of Monticello. Take Interstate 64 West to Exit 121 at Charlottesville. At the end of the exit ramp turn left onto Va. Route 20 South. At the second stoplight, turn left onto Route 53 (Thomas Jefferson Parkway). Follow Route 53 East for about 1.75 miles. Immediately after passing under the stone-arch Saunders Bridge, exit right onto the roadway that leads over the bridge and onto the grounds of Monticello. Take U.S. 29 North to Charlottesville. Take Interstate 64 East (direction Richmond) and get off at Exit 121A onto Va. Route 20 South (direction Scottsville). At the second stoplight, turn left onto Route 53 (Thomas Jefferson Parkway). Follow Route 53 East for about 1.75 miles. Immediately after passing under the stone-arch Saunders Bridge, exit right onto the roadway that leads over the bridge and onto the grounds of Monticello. Take Interstate 64 East to Charlottesville and get off at Exit 121A onto Va. Route 20 South (direction Scottsville). At the second stoplight, turn left onto Route 53 (Thomas Jefferson Parkway). Follow Route 53 East for about 1.75 miles. Immediately after passing under the stone-arch Saunders Bridge, exit right onto the roadway that leads over the bridge and onto the grounds of Monticello. Parking at Monticello is free. There are spaces for buses, RVs, and trailers. Disabled parking spaces are located near the David M. Rubenstein Visitor Center and Carl and Hunter Smith History Center (handicapped license plate or tag required). Guests are advised to lock their vehicles. Monticello is not responsible for loss or damage incurred in the parking area. Overnight parking is prohibited. PLEASE NOTE: No bags or backpacks exceeding 11" by 15" by 6" are allowed beyond the Visitor Center; all bags will be inspected. After picking up your ticket(s) at the Visitor Center, a 25-passenger shuttle bus will transport you to the mountaintop (unless you choose to take the trail; see below). 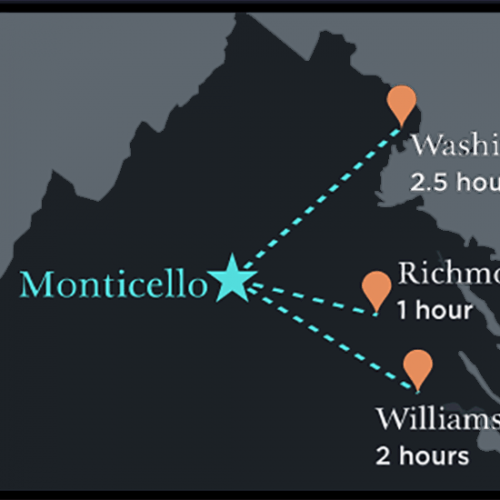 Passengers will be dropped off near Monticello's East Walk where they can also board to take the shuttle back to the Visitor Center and parking area. On the return trip, the shuttle will stop Jefferson's gravesite and drop off and pick up passengers as needed. Guests must be seated while riding the bus. Smoking is prohibited. Many guests enjoy taking the trail the relatively short distance (roughly half a mile) from the David M. Rubenstein Visitor Center parking area to the house. But be sure to pick up your ticket(s) first; a Monticello ticket is required to walk up this trail.